Location Manager, a job that roams the country to find locations. Kim Tae Young(left) is the CEO of “Location Plus” as a location manager who first started working in a fast food restaurant. The motto of “connecting people and space” is representative of his life, and he has been working without rest for 15 years since 2002. A compass placed in an office filled with calm classical music captured the eyes of this reporter. The role of the location manager to move the imaginary world filled with text into a real space is like that of a compass that guides ships to land through foggy mist. Let’s explore the allure of this job called a location manager through an interview with Tae Young Kim, one of the fewer than 100 location managers in Korea. For the readers who are unfamiliar with “Location Managers,” would you please describe the job to us? Location Manager is a term derived from the name of a chip that performs GPS on a smartphone. We find the best locations for various work. As we call the person who searches for wild ginseng as “Simmanyi,” I introduce my job as a “location simmanyi” for finding locations. The location manager is a person who finds stories in space. Even when we are visiting the same place, we try to see things that ordinary people cannot see. That’s why I have a habit of talking to myself when walking on the streets. It may seem strange to imagine things continuously in your head while talking to yourself in a space that has nothing. But looking for the right space for a specific situation is a continuation of work that cannot be logically explained. You have to keep thinking about how you can imagine the story and where the hero must appear so that it all looks beautiful on the screen. You need to think of how you can express the emotions of the character. What led you to the path of the location manager? The first major I chose in university was mechanical engineering, but after being discharged from military service, I changed my major to photography. I was interested in photography since I was in junior high school, and I was able to continue my dreams again at the age of twenty-five. At first, I started working in a video editing company. Everyone has a high performance smartphone, and I felt that it became too difficult to get into the photography industry. Then, one of my colleagues from university suggested I try this job called “location manager” that exists in the U.S., but not in Korea. We ended up starting a company made up of three college classmates. I remember that the 2002 World Cup was going on. At first, we didn't have a proper office, so we met every day at a fast food restaurant. We officially started work by getting a small office in one building. I can still remember how the office looked, which was so uncomfortable with all these large stones in one corner. We certainly did not start in a good environment. The fact that you ' look for space' seems rather vague to me. What is the scope of work of a location manager business? It differs, according to the work genre. For the film industry, if the production team is formed and we are in charge of locations, we suggest the best spots for different scenes until right before shooting begins. We usually read the script while roaming around the country. I walk around different places, eat, and wait for the sun to change and see change in the landscape. Then we get familiar with the space and take pictures at different angles while assigning the main character's position and situation in that space. After that, I gather and have meetings with many people such as cinematographers, artistic directors, and PDs. When the space is confirmed, I organize the schedule. It's also important to get permission to shoot during this process. In many cases it is necessary to contact public institutions, such as railways and roads, as well as private buildings. The parts that can be solved through formalities are solved in advance. Otherwise, I make it happen through taking a direct business trip. It’s a little bit different for advertising. Jobs are offered from production usually two weeks in advance, and they last two or three days if they’re short. Then we select the place to see the continuity, post permission letters for smooth shooting, organize traffic on the spot, and take charge of many parts while recommending places to stay for staff members. Advertising pays more than movies or dramas, but the period of work is short, and there’s a lot of work to do. The risk is also high. For example, there are a lot of cases where I receive a bid today, and I need to find space until the next day. That’s why I want to build a database by visiting as many places as possible. That way, you can quickly find the right place at any time. I’m sure there are cases when the coordination of opinions on selecting the space is not good. Obviously, there are cases when opinions completely clash between us and the production team. The obvious thing is that time flies even during contemplation. Rather than just preparing one answer from the beginning, we present a variety of candidates, ranging from B to C to D. We are ready for rejections, so we put various options in each subfolder from A to D when we hand over the photo material in the first place. I think that this is necessary to efficiently save time and work because we all have different perspectives. We may proceed to E, F, G while continuing to worry, and eventually return to A in some cases. I always feel that it is very important not only to stick to my opinion all the time, but also to prepare many choices for my client and to negotiate effectively to explain what I have prepared for them. What was the most memorable work you've done while working as a Location Manager? At the end of the film, I remember the scene where Joo Jin-mo and Jo In-sung run on horseback in the fields of Goguryeo. The movie ended with the scene pausing like a Goguryeo mural. Because it was the ending, it was a very important scene. 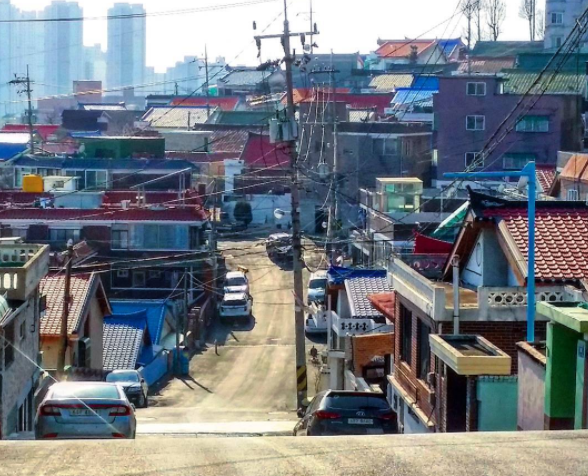 From a location perspective, it was not an easy place to find in Korea. It had to look like Goguryeo, and it also had to have a sunset and a horizon all the way to the end. When I saw the scene, I remembered a fossil spot near the Hwasong fishing boat airfield, and I remember struggling at the point of coordinating opinions. What is the most difficult thing in work? It's when the feedback by the production team for our work is not well received. Usually, directors and the production team find a suitable place based on the script on their own, and they only hire us when it's difficult to find one. It's obvious that locations are hard to find. In this case, it would be nice if we could support each other's expertise and cooperate. However, some production staff have preconceptions about location teams, or there are cases in which they perceive it as competition rather than cooperation. We do this because we have so much experience and our own databases. We can also see things that are not visible to the public. That's why we offer a lot of opinions. I think that it’s necessary for everyone to respect professionals and listen to them to some extent. What are some of the pluses of being a location manager? If I had continued taking pictures instead of working as a location manager because I majored in photography in college, I would have probably become a cinematographer by now. The cinematographer specializes in shooting, so it's not easy to experience other areas. I like the fact that the location manager can experience and explore different places. For example, I often also take videos while working as a location manager. I collect my experiences and photo materials, and I’ve also written a book. I have been steadily blogging to raise awareness of the job referred to as location manager. It is a pleasure to inform people that there are beautiful landscapes in our country through writings and photographs. I want to participate in movies as well as commercials every two years. Not long ago, I participated in Jeonnam's “Beautiful Ten Scenes” selection committee, and I actively participated in external activities such as acting as a consultant to plan the torch run route in the PyeongChang Winter Olympics. I think it’s great that I can such meaningful experiences because of my job. What qualities do you need to be a location manager? Location managers are likely to find themselves in risky situations in many ways. You yourself are your greatest tool. It is difficult to do this if you cannot control your feelings, such as being irritated or not being able to control your anger. Therefore, I think that the most important basic qualities are an attitude of consideration for others and a positive work ethic. It is better to have a bright and positive impression because you have to meet people from all walks of life, regardless of region, in order to get permission to shoot. If you give a bad impression to a person who you've never met, things will not go well. In terms of skill, driving is required because we have to go all over the country. You also need to develop a way of seeing things and interpret images in detail. Those skills, however, can be learned gradually. The most important thing is the ability to communicate clearly in a difficult situation. As a location manager, please tell us if you have any future views or wishes. Currently, there are not more than 100 people working as location managers in Korea. I know that about 40 people are engaged in advertising, and 20 or 30 are in broadcasting or dramas. Although it is a small number, it is likely to remain the same or increase slightly in the future. I don't think this will change. The areas of work for location managers are divided as of now. But I hope in the future, location managers who can work regardless of the genre will grow in number. I think that becoming an expert by experiencing different genres and knowing locations would allow one to be respected as a professional in society. Limitations exist for any kind of job. When you scoop the sand with your hands on the beach, the sand keeps falling out of your hands, even if you do not move. You have to keep on adding new sand so that you won’t run out of sand in your hands. If you challenge yourself continuously to break your limits, I believe you will have a good result.